Background: Emergency department evaluation of young febrile children often includes measurement of white blood cell (WBC) count. Although a high WBC count is associated with an increased likelihood of infection, the clinical significance of extreme leukocytosis (EL) (a WBC count of ≥25,000/mm 3 ), has not been well studied. Objective: The aim of this study is to study the correlation between the level of WBC and the cause of fever in febrile children and to assess if WBC level helpful in predicting the seriousness of febrile illness. Patients and Methods: A cross-sectional case series study conducted over 5 months from August 01 to December 31, 2015, in the emergency department at child central teaching hospital in Baghdad city in Iraq. The study was evaluating children aged 3-36 months admitted to the emergency department for fever. WBC count was done either manually or a complete blood count by automated hematologic analyzer. Results: Of those 129 febrile children were enrolled in this study, 42 patients with EL were identified and compared with 87 patients with moderate leukocytosis (ML). Pneumonia was the only diagnosis found to be significantly higher in EL group 17 cases (40.5%) versus 15 cases (17.2%) in ML group with P value (0.004). Meningitis was higher in patient with ML with P value (0.03). Finally, EL was associated with higher rates of admission to hospital (P < 0.036). Conclusions: The presence of EL indicates a higher risk of having pneumonia. 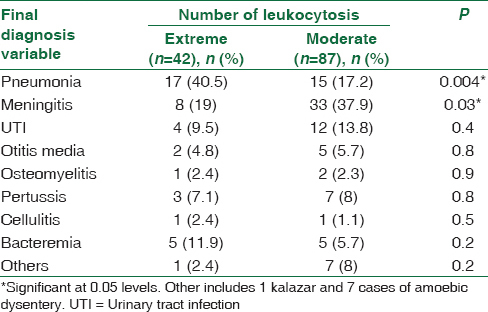 The degree of leukocytosis (extreme or moderate) does not affect the rates of serious bacterial infection. The aims of this study were to study the correlation between the level of WBC and the etiology of fever in febrile child and to assess if WBC level helpful in predicting the seriousness of febrile illness. A cross-sectional case series study conducted over 5 months from August 01 to December 31, 2015, in the emergency department at child central teaching hospital in Baghdad city in Iraq. One hundred and twenty-nine febrile children (axillary temperature 38°C or more) aged 3-36 months admitted to the emergency department were included in the study regardless of the associated signs and symptoms. Children with a known underlying chronic illness (e.g., malignancy, sickle cell anemia, immunodeficiency, cystic fibrosis, asthma) were excluded from the study also children who recently received a drug known to cause leukocytosis (e.g., steroid) also were excluded. Detailed history and complete physical examination was done for all children enrolled in the study to find out the cause of fever. Temperature was taken by electronic thermometer in the axilla. All patients were sent for WBC count either manual or complete blood count (CBC) by automated hematologic analyzer (RUBY ® ). 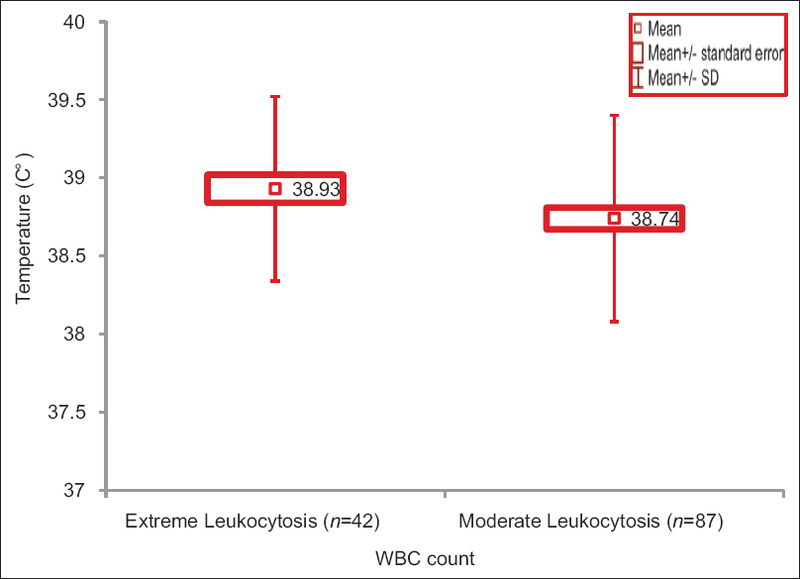 According to WBC count results, patients were divided into two groups: 42 patients who found to have WBC count ≥25.000/mm 3 defined as EL, whereas 87 patients who have had WBC count 15.000-24.999/mm 3 considered as moderate leukocytosis (ML). Chest X-ray (CXR), blood culture and sensitivity (C/S), general urine examination was obtained in all patients, whereas urine C/S were done by bladder catheterization only in those who found to have ≥5WBC in urinalysis and lumber puncture was done for those who was suspected to have central nervous system infection based on history and/or clinical examination. The final diagnosis and treatment plan with the need for admission was recorded for all patients. Patients considered having SBI if the child found to have one of the following (meningitis, osteomyelitis, bacteremia, UTIs, pneumonia, and cellulitis). Hence, in this study, Proven SBI was defined as the presence of positive culture (blood, cerebral spinal fluid [CSF], urine) obtained from the patients at emergency department diagnosed as cases of (bacteremia, bacterial meningitis, UTI), respectively. We created the category of probable SBI to include those infections that were probably bacterial in origin and treated as such although not proven by culture. This category included pneumonia (considered bacterial in origin when CXR shows alveolar infiltrations particularly lobar consolidation identified by pediatric radiologist and CBC shows neutrophilia), cellulitis (diagnosed clinically by the presence of redness, tenderness, swelling), osteomyelitis (diagnosed by magnetic resonance imaging), meningitis with negative CSF culture (neutrophilic pleocytosis and low glucose level in CSF analysis). Each patient assigned a serial identification number. The data were reviewed and analyzed using Statistical Package for Social Sciences version 20 (IBM Corp. Armonk, NY, USA). Categorical data represented by frequency and percentages. The Chi-square test was used to assess the association between the categorical data. The Shapiro-Walk test was used to test data distribution. The continuous variables were presented as mean, standard deviation, median, and range accordingly. A total of 129 children aged 3-36 months with fever and leukocytosis (WBC >14,999 mm 3 ) were identified, 42 patients with EL were compared to 87 patients with ML. The mean body temperature of the patients at the time of admission to the emergency department was (38.9 ± 0.6) in EL versus (38.7 ± 0.7) in ML P value (0.1); it was not significantly different in the two groups as shown in [Figure 1]. The mean age and standard deviation for case group were (13.07 ± 10.55), whereas it was (12.11 ± 8.55) for control group. Male percentage in EL group was (59.5%) versus (54%) in ML group, whereas female percentage in EL was (40.5%) versus (46%) in ML group. The male to female ratio was 1:1.47 in EL group and 1:1.17 in ML group. The distribution of the patients according to their age and gender in this study were statistically not significant between patient with EL and those with ML with P values (>0.5) for both as shown in [Table 2]. CXR was positive for pneumonia in 17 (40.5%) in EL group VS 15 (17.2%) in ML group so it was statistically significant in EL with (P = 0.004). In addition, Blood C/S was positive in 6 (15.4%) in EL group versus 9 (10.5%) in ML group found to be statistically not significant with (P = 0.4) as shown in [Table 3]. Urine culture done in 113 patients (39 in EL and 74 in ML), urine C/S were positive in 5 (12.8%) in EL versus 15 (20.3%) in ML so was not significant with (P = 0.3) as noted in [Table 3]. Cerebrospinal fluid analysis and culture obtained in 83 patients (26 in EL vs. 57 in ML). It was positive in 8 (30.8%) in EL vs. 33 (57.9%) in ML which was significant in ML group with (P = 0.022). There was no difference between both groups in frequency with which these studies were performed as shown in [Table 3]. Pneumonia was the only diagnosis found to be significantly higher in EL group 17 cases (40.5%) versus 15 cases (17.2%) in ML group with P value (0.004). 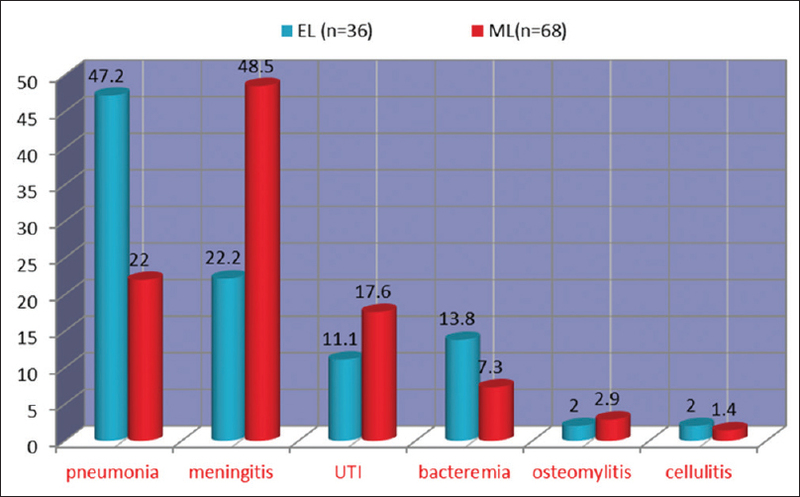 Meningitis was more common in ML 33 (37.9%) than EL 8 (19%) with P value of (0.03). No significant difference was found among both groups in regard to frequencies of other diagnoses (P value for all >0.05) as noted in [Table 4]. In this study, SBI (proven and probable) found in 36 (85.7%) in EL group versus 68 (87.1%) in ML group with (P = 0.3), the most common SBI in the EL patient was pneumonia (47.2%) as shown in [Figure 2]. Hospitalization was significantly greater in EL than patients with ML 83.3% versus 65.5% with (P = 0.036) as shown in [Table 5]. From 129 cases included in this study, only one case died during hospitalization in EL group and no death was recorded in patients with ML. In this study, there was no statistically significant difference between patients with EL and those with ML regarding degree of fever and gender with P value (0.1) and (0.5), respectively, this result was similar to study by Shah et al. The current study shows that there are no differences in the frequency of diagnoses between a patient with moderate or EL groups with exception of pneumonia and meningitis. Pneumonia was significantly higher in EL17 (40.5%) versus 15 (17.2%) in ML group with P value (0.004). Meningitis was higher in ML 33 (37.9%) than those with EL 8 (19%) with P value (0.03), while Shah et al. found that all diagnoses were not significantly different between EL and ML groups finding could be explain by short study time in the current study while Shah et al. study performed over 3 years although both studies carried out at similar settings (emergency department of an urban tertiary hospital). Pneumonia was the most prevalent diagnosis in patient with EL (40.5%) this is similar to result found by Bachur et al. and Lawrence et al. with percentages (28% and 30%), respectively. While Shah et al. found that pneumonia account for only (13%) of patient with EL. This finding suggests that child 3-36 m with fever and with EL should be evaluated thoroughly and CXR should be considered to exclude pneumonia similar recommendation made by Bachur et al. and also to that given by the UK's national institute for health and clinical on fever in children ≤5 years. In our study, Otitis media found in only (4.8%) of patient with EL while Shah et al. found that otitis media was the most common diagnosis in patient with EL (40.7%), this could be attributed to the fact that cases of otitis media in our hospital usually not admitted to emergency department (the place where our study conducted) unless patient had complication and/or unable to take oral treatment. The risk of bacteremia in febrile children increase as WBC count increase,  Lee and Harper found that the risk of bacteremia increases from (0.5%) for WBC <15,000 mm 3 to greater than (18%) for WBC more than 30,000/mm 3 . In our study, (15.4%) of a patient with EL had bacteremia, however, the risk of bacteremia was not statistically significant from those with ML which is similar to that found by Shah et al. In our study, the overall rate of SBI in patient with EL was (85.7%) This percentage is much higher than results found by Brauner et al. (39%)  and Mazur et al. (18%),  Shah et al. (25%) for proven SBI and (52%) for combined proven and probable SBI, Danino et al. (39%). This could be explained by a probable over diagnosis of SBI in our study as a result of lack of some confirmatory tests like lack of colony count in urine culture results in considering any case with the growth of any pathogenic bacteria in urine culture as UTI and treated as such. The risk of SBI in EL group was not significantly higher than that in a patient with ML (P = 0.309), a result similar to that found by Shah et al. but different to what found by Brauner et al. and Mazur et al. Mazur et al. found that the risk of proven SBI was higher in children with EL compared with those with ML. The incidence of proven SBI from the Mazur et al. study was even higher with a WBC count of ≥35,000/mm 3 as the cutoff value. Shah et al. found that the overall rate of proven SBI was comparable with that found by Mazur et al. but the incidence of proven and combined proven or probable SBI in children with EL, did not differ from the incidence in children with ML. The rates of proven SBI were similar between EL (25%) and ML (17%) patients. Differences in the combined rates of proven or probable SBI between the EL (52%) and ML (35%) patients were not statistically significant. The most common SBI in patient with EL in our study was pneumonia which agrees with what found by Danino et al. and Shah et al. The need for hospital admission was significantly higher in patient with EL (83.3%) similar to that found by Shah et al. and to Lawrence et al. (49%, 100%) respectively. In febrile children aged 3-36 months, the presence of EL indicates a higher risk of having pneumonia. Otherwise, it is not helpful alone in finding out the cause of fever. The degree of leukocytosis (extreme or moderate) does not affect the rates of SBI. EL is good indicator for need for hospital admission rather than outpatient management. Luszczak M. Evaluation and management of infants and young children with fever. Am Fam Physician 2001;64:1219-26. Nelson DS, Walsh K, Fleisher GR. Spectrum and frequency of pediatric illness presenting to a general community hospital emergency department. Pediatrics 1992;90(1 Pt 1):5-10. Tamas RP, Gus MG. Fever in adults. In: Garmel Gus M, editor. An Introduction to Clinical Emergency Medicine. 2 nd ed. United Kingdom: Cambridge University Press; 2012. p. 5-375. Axelrod YK, Diringer MN. Temperature management in acute neurologic disorders. Neurol Clin 2008;26:585-603, xi. Barone JE. Fever: Fact and fiction. J Trauma 2009;67:406-9. Barton DS. Fever in childhood. Pediatrics 1984;74:929. Trautner BW, Caviness AC, Gerlacher GR, Demmler G, Macias CG. Prospective evaluation of the risk of serious bacterial infection in children who present to the emergency department with hyperpyrexia (temperature of 106 degrees F or higher). Pediatrics 2006;118:34-40. Press S. Association of hyperpyrexia with serious disease in children. Clin Pediatr (Phila) 1994;33:19-25. Belfer RA, Gittelman MA, Muñiz AE. Management of febrile infants and children by pediatric emergency medicine and emergency medicine: Comparison with practice guidelines. Pediatr Emerg Care 2001;17:83-7. Baraff LJ, Bass JW, Fleisher GR, Klein JO, McCracken GH, Powell JK. Practice guideline for the management of infants and children 0 to 36 months of age with fever without source. Pediatrics 1993;92:1-12. Chiu CH, Lin TY, Bullard MJ. Identification of febrile neonates unlikely to have bacterial infections. Pediatr Infect Dis J 1997;16:59-63. Baskin MN. The prevalence of serious bacterial infections by age in febrile infants during the first 3 months of life. Pediatr Ann 1993;22:462-6. Jaskiewicz JA, McCarthy CA, Richardson AC, White KC, Fisher DJ, Dagan R, et al. Febrile infants at low risk for serious bacterial infection - An appraisal of the Rochester criteria and implications for management. Febrile Infant Collaborative Study Group. Pediatrics 1994;94:390-6. Alpern ER, Alessandrini EA, Bell LM, Shaw KN, McGowan KL. Occult bacteremia from a pediatric emergency department: Current prevalence, time to detection, and outcome. Pediatrics 2000;106:505-11. Rothrock SG, Harper MB, Green SM, Clark MC, Bachur R, McIlmail DP, et al. Do oral antibiotics prevent meningitis and serious bacterial infections in children with Streptococcus pneumoniae occult bacteremia? A meta-analysis. Pediatrics 1997;99:438-44. Baraff LJ, Oslund S, Prather M. Effect of antibiotic therapy and etiologic microorganism on the risk of bacterial meningitis in children with occult bacteremia. Pediatrics 1993;92:140-3. Nield LS, Kamat D, Fever without focus .In: Kliegman RM, Stanton BF, St. Geme III JW, Schor NF eds. Nelson textbook of pediatrics, 20 th ed. Canada. Elsevier 2016:1280-82. Shapiro MF, Greenfield S. The complete blood count and leukocyte differential count. An approach to their rational application. Ann Intern Med 1987;106:65-74. Curnutte JT, Coates TD. Disorders of phagocytic function and number. In: Hoffman Hematology: Basic Principles and Practice. 3 rd ed. St. Louis, MO: Elsevier Churchill Livingstone; 2000. p. 721-2520. Zorc JJ. Leukocytosis. In: Schwartzs Clinical Handbook of Pediatrics. 4 th ed. Philadelphia: Wolters Kluwer, Lippincott Williams and Wilkins; 2009. p. 559. Shah SS, Shofer FS, Seidel JS, Baren JM. Significance of extreme leukocytosis in the evaluation of febrile children. Pediatr Infect Dis J 2005;24:627-30. Lawrence YR, Raveh D, Rudensky B, Munter G. Extreme leukocytosis in the emergency department. QJM 2007;100:217-23. Lee GM, Harper MB. Risk of bacteremia for febrile young children in the post-Haemophilus influenzae type b era. Arch Pediatr Adolesc Med 1998;152:624-8. Wenz B, Gennis P, Canova C, Burns ER. The clinical utility of the leukocyte differential in emergency medicine. Am J Clin Pathol 1986;86:298-303. Reding MT, Hibbs JR, Morrison VA, Swaim WR, Filice GA. Diagnosis and outcome of 100 consecutive patients with extreme granulocytic leukocytosis. Am J Med 1998;104:12-6. Holland SM, Gallin JI. Disorders of granulocytes and monocytes. In: Kasper DL, Braunwald E, Fauci AS, Hauser SL, Longo DL, Jameson JL, editors. Harrison's Principles of Internal Medicine. 16 th ed. New York: McGraw-Hill Medical Publishing;2004. p. 349-57. Jamuna R, Srinivasan S, Harish BN. Factors predicting occult bacteremia in young children. Indian J Pediatr 2000;67:709-11. Bachur R, Perry H, Harper MB. Occult pneumonias: Empiric chest radiographs in febrile children with leukocytosis. Ann Emerg Med 1999;33:166-73. National Collaborating Center for Women's and Children's Health. Feverish Illness in Children: Assessment and Initial Management in Children Younger Than 5 Years. Clinical Guideline No. 47. London: National Institute for Health and Clinical Excellence; 2007. p. 142. Brauner M, Goldman M, Kozer E. Extreme leucocytosis and the risk of serious bacterial infections in febrile children. Arch Dis Child 2010;95:209-12. Mazur LJ, Kline MW, Lorin MI. Extreme leukocytosis in patients presenting to a pediatric emergency department. Pediatr Emerg Care 1991;7:215-8. Danino D, Rimon A, Scolnik D, Grisaru-Soen G, Glatstein M. Does extreme leukocytosis predict serious bacterial infections in infants in the post-pneumococcal vaccine era? The experience of a large, tertiary care pediatric hospital. Pediatr Emerg Care 2015;31:391-4.